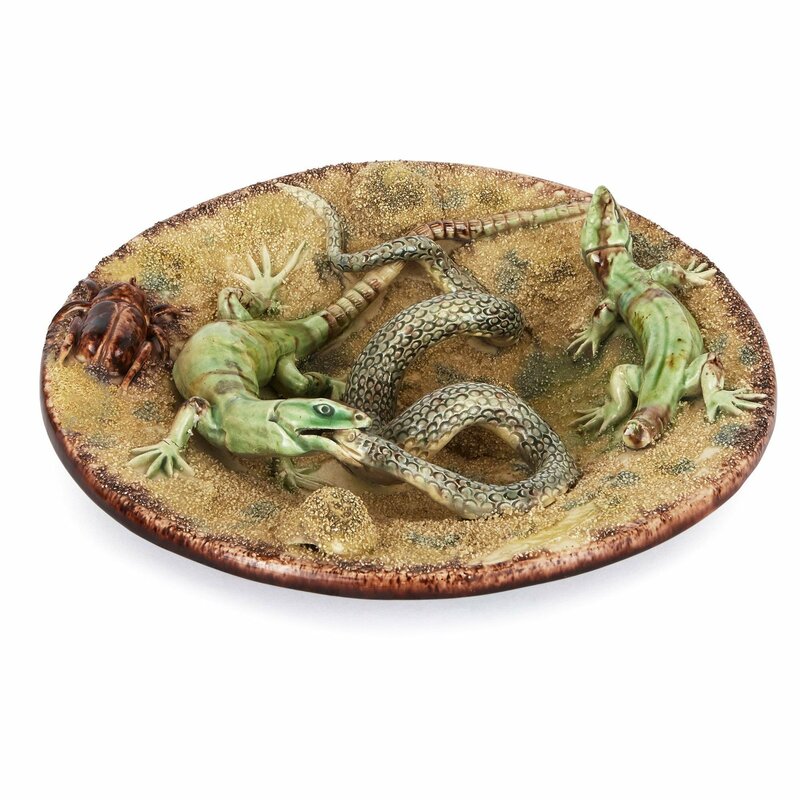 Crafted in the style of the French 16th century potter, Bernard Palissy, these intriguing plates are sure to shock and delight in equal measure. 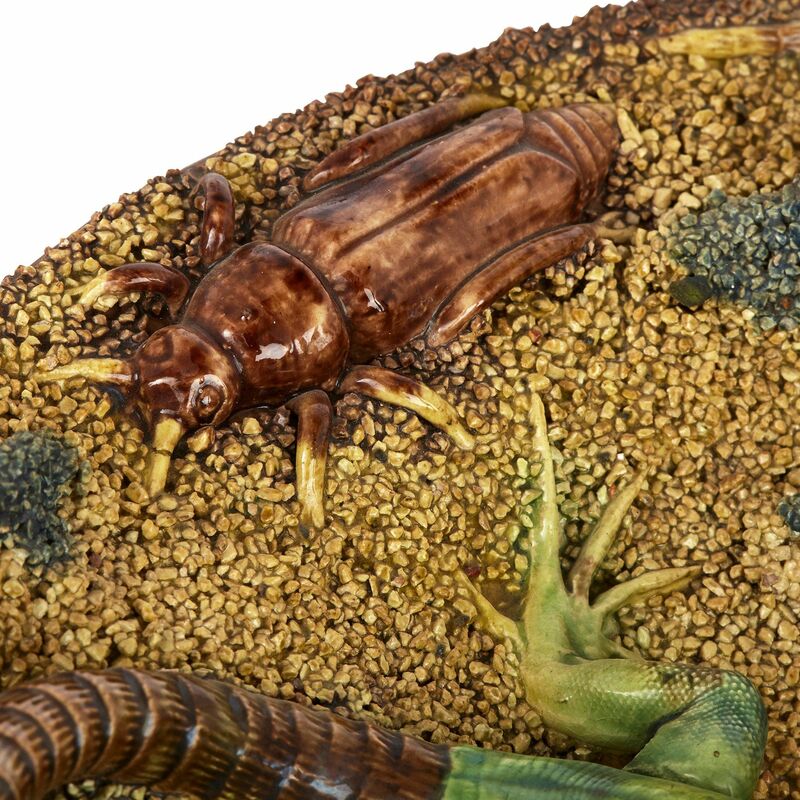 These exceptional plates are typical examples of the tradition of Portuguese Palissy-style ceramics, an important movement in the decorative arts in the second half of the 19th Century. Their maker, ceramicist Manual Cipriano Gomes Mafra (1829-1905), was the spearhead of this movement and is one of the most celebrated Portuguese ceramicists of all time. Mafra was the first of what would later become a large group of ceramicists to settle in the small town of Caldas de Rainha. 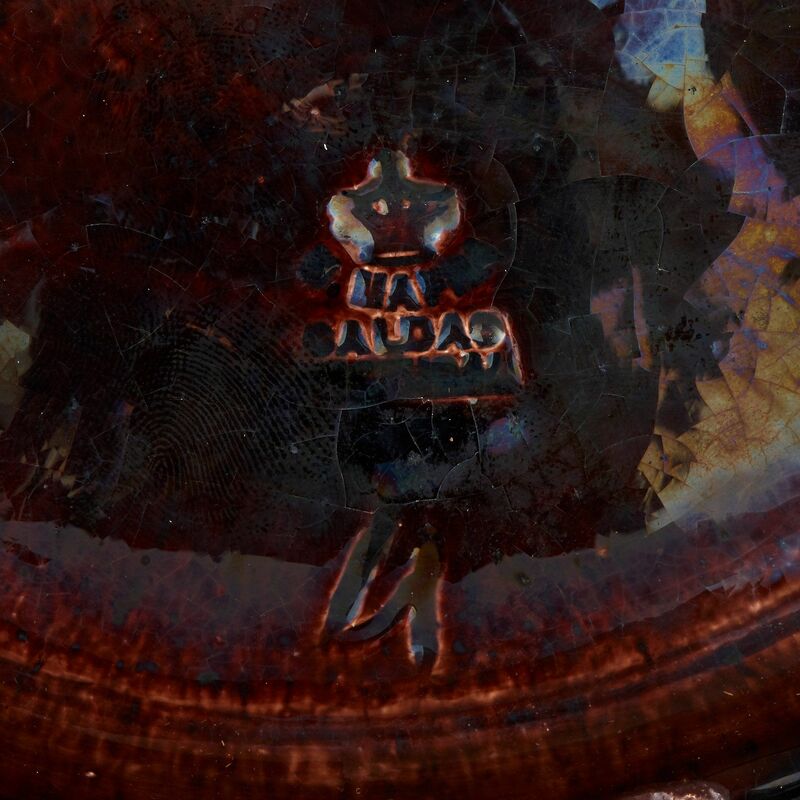 Caldas would later become famed as the foremost producer of ceramics in the 19th Century, and especially of Palissy-ware. 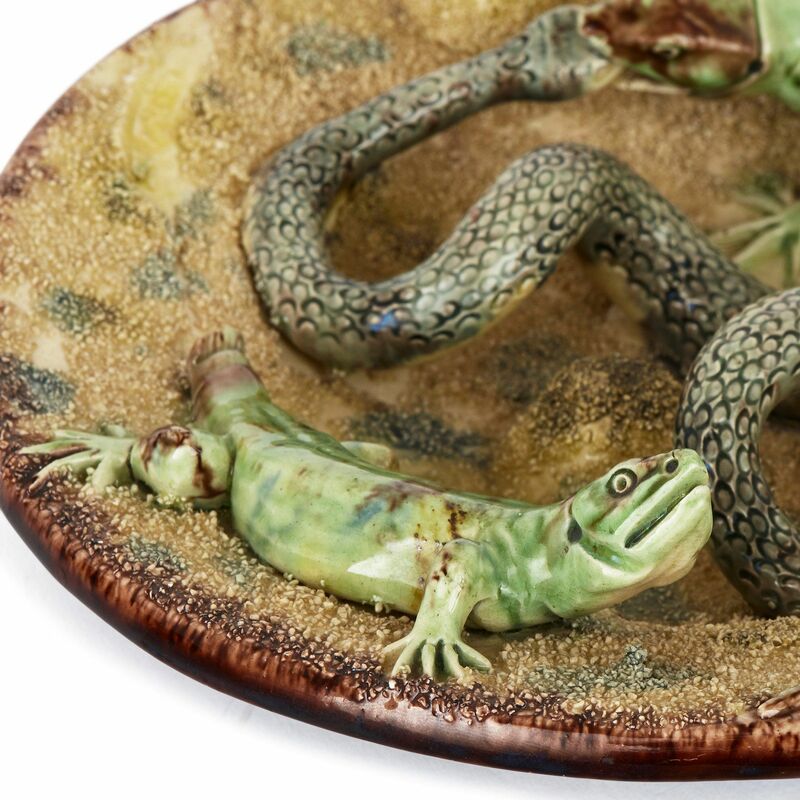 So-called 'Palissy-ware' was an extremely popular style of ceramics in the 19th Century, influenced by the work of French potter Bernard Palissy (c.1510-c.1589), much of which had been rediscovered in the period. 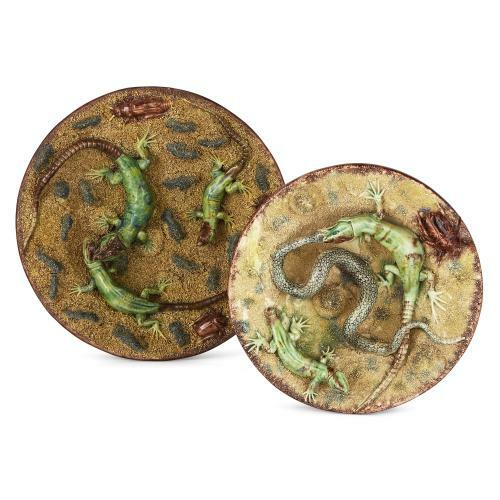 Palissy was famed for his 'figulines rustiques', or decorative faience fired in a high-relief pattern inspired by nature, and especially pond life: reptiles, insects, flowers and fish. 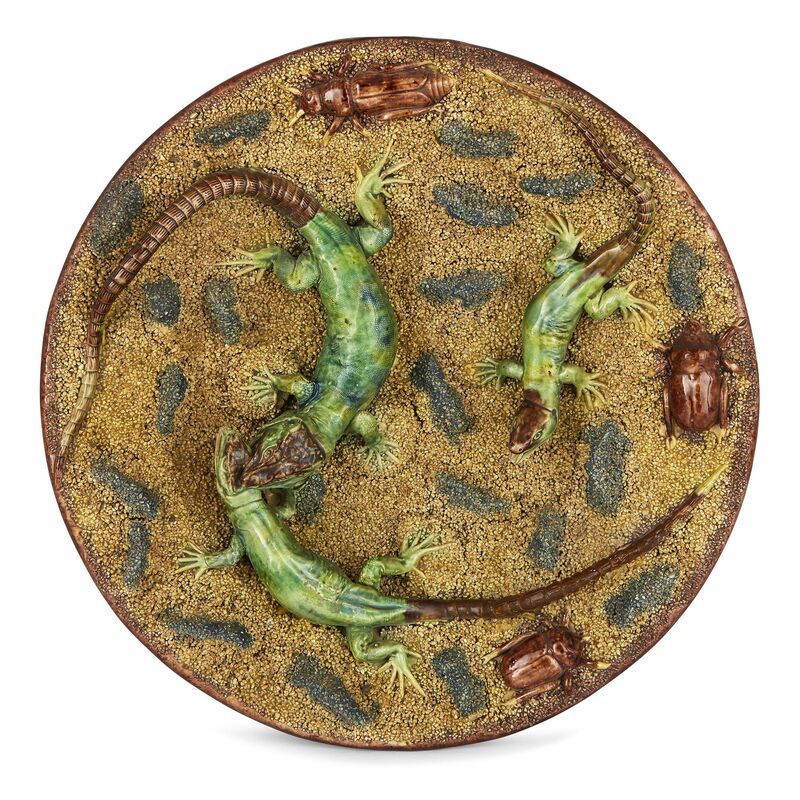 It is said that Mafra first became inspired by Palissy when he came across a plate purchased by his friend in Paris. 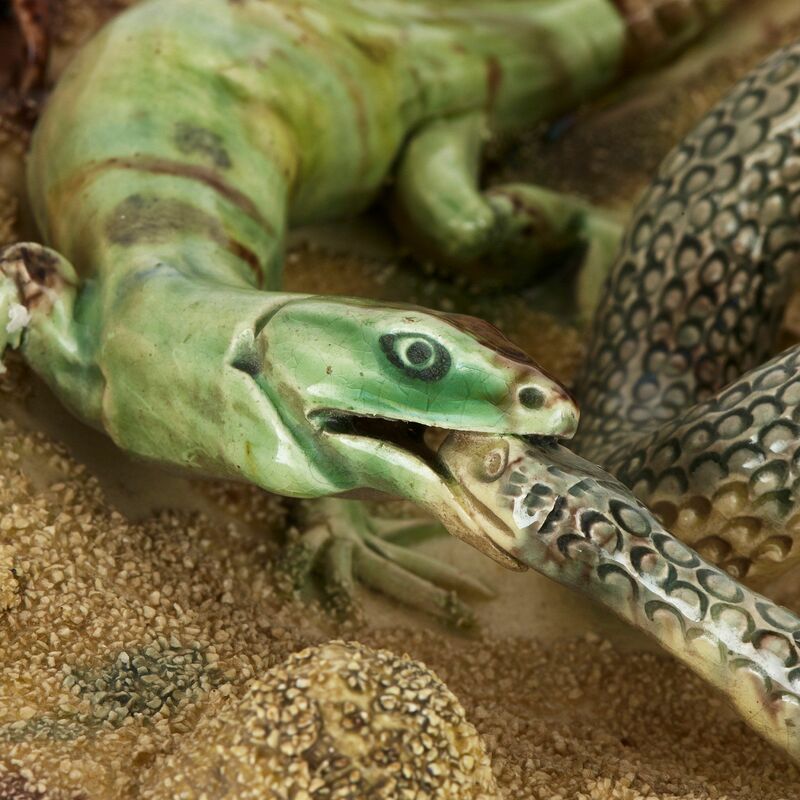 19th Century copies of Palissy's work were made in both faience and in majolica, a 19th Century version of faience with an improved lead-based glaze. 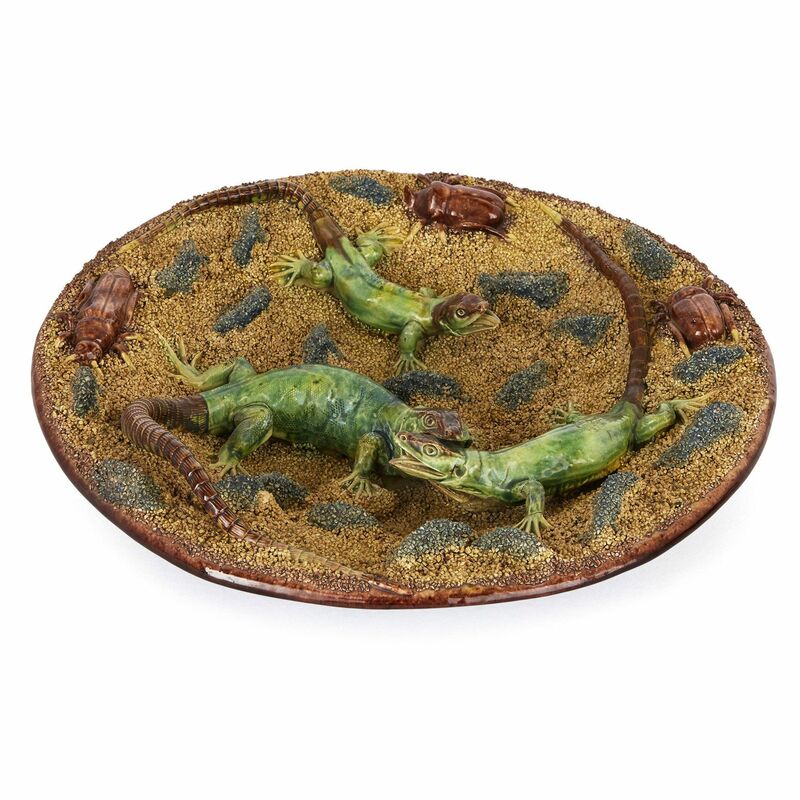 These beautiful majolica plates are the work of the factory Mafra opened in 1853, the first of its kind to be dedicated solely to the production of majolica Palissy-ware. The plates are round in shape and are beautifully glazed with the strong, naturalistic colour palette of greens and browns for which Mafra was famed. They each depict lizards and snakes fighting, surrounded by cockroaches, beetles and other insects. 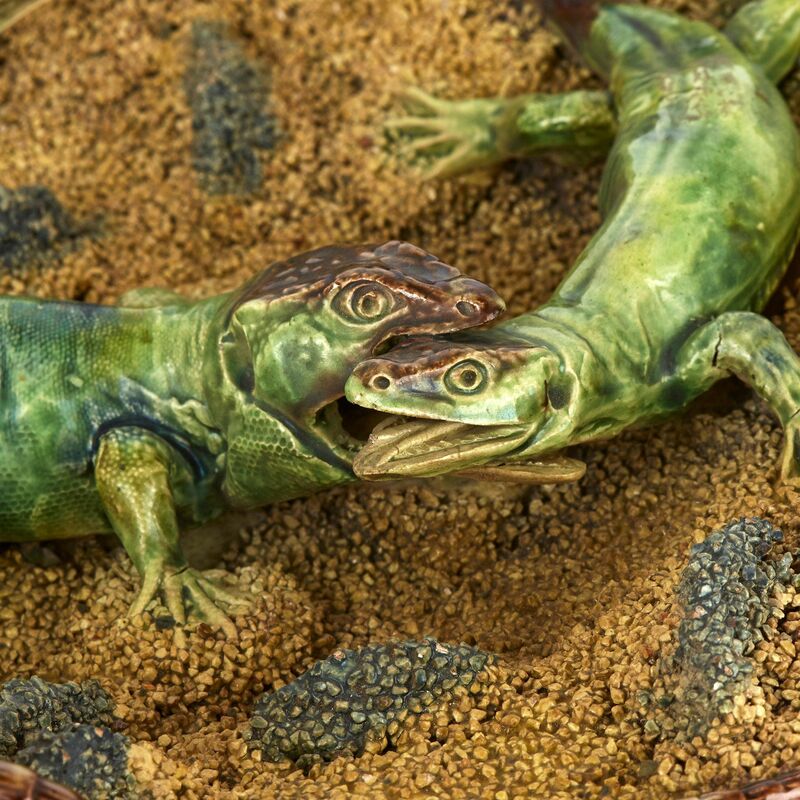 Again, these are typical scenes to be depicted on Mafra's Palissy-ware. 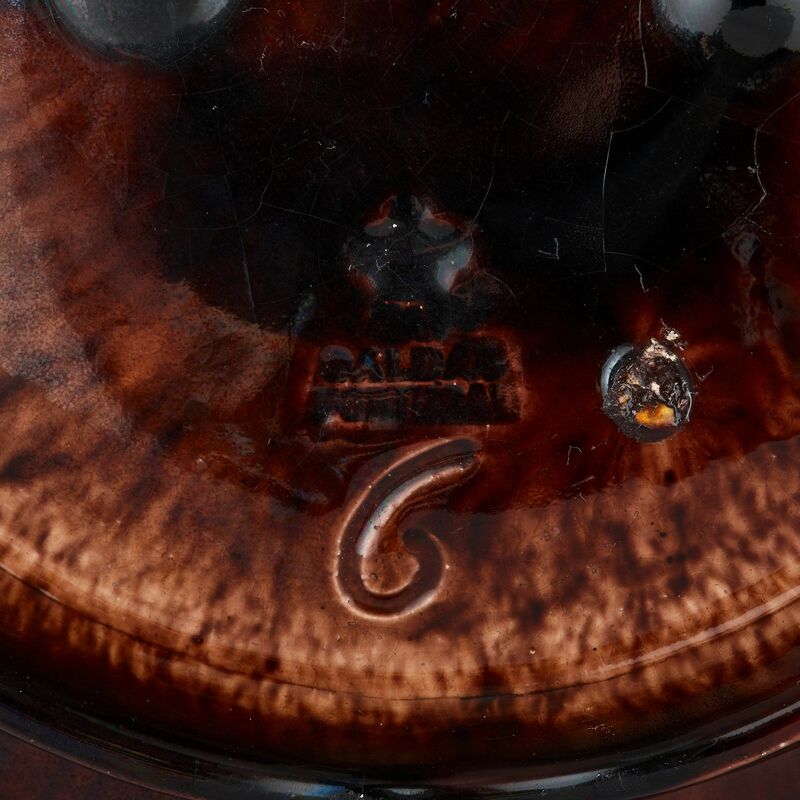 Each plate is marked to the underside with the maker's mark for Manuel Mafra, reading 'M. MAFRA / CALDAS / PORTUGAL'. One is numbered '4' and the other '6'.